- No contracts to renew life of card/player as found in other similar card collecting modes in other sports franchises. - Immortals will primarily be the only 99 overall players in the game. - Comparison between 17 and 18 for Breakout Barry Larkin card. - Comparison between 17 and 18 for Craig Kimbrel card. - Individual pitch velocities now shown outside of gameplay in front end on player card. - Best legends at each position are considered the 'end-game rewards.' 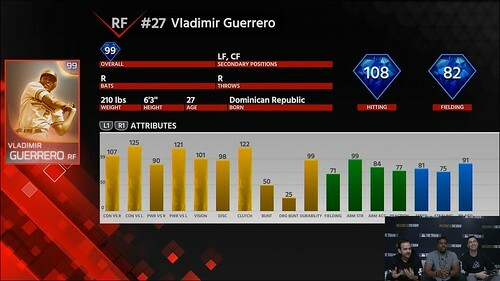 Includes players such as Ruth, Robinson, Bob Gibson, and Griffey Jr.
- Player card shown for Vlad Guerrero. - Immortals are not based on one season, but rather an amalgamation of a player's career. (Ordinary flashbacks and legends are based one year.) Each individual Immortals rating is based off player's best year in that category. - 'Diamond shields' on upper right of card show top ratings areas that contribute to overall rating. - Increased attribute cap did not result in reduced effectiveness of ratings. IE: A 99 Power in MLB 17 is still the same 99 Power in MLB The Show 18. 125 is simply that much better to make a player stand out. - PCI has been re-calibrated in MLB 18. It is an aggregate of Contact and Plate Vision. - Not all player ratings have the new cap of 125. 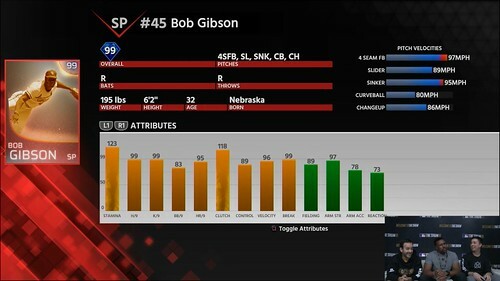 Ratings that have cap of 125 include: (Batters) Contact, Power, Vision, Discipline, and Batting Clutch; (Pitchers) Stamina, P/9 ratings, and Pitching Clutch. - Ratings are still being tweaked and are not yet exactly final. - Souvenirs are designed as more of reward than something that is a hassle to attain. - Immortals will never be in card packs or marketplace. Best cards can never be purchased, only earned. - Quirks exist the same as last year. Legends will have Quirks as well. - As with Career Arc program/cards, there will be numerous versions of Immortal players. - Speed rating cap is 99. Speed now determined by advanced data provided by MLB instead of previous in-house formula that used game statistics. - Closed Alpha was to test new online tech. Entire online service was re-written. New system will allow dev team more visibility on issues/bugs to address them faster. - Those who participated in Closed Alpha will receive a reward pack which will contain a Gold Live Series player. - Quick look at Ruth Immortals program shown. - Horizontal card orientation for the first time. - Quick look at Kennys Vargas Rookie Flashback program shown. - Tampa Bay Epics program shown. Collecting component of Epics in past has now been removed. - Universal nameplates (IE: Team nameplate) can be earned in programs this year. - Some rewards will only be attainable via collecting of souvenirs. - Career Arcs program discussed. These players are just 'one step below' the Immortals. - Packs: Standard Packs return. Team does not view them as essential for Diamond Dynasty. - Created Player program shown. Archetypes will now have created player with strengths and weaknesses at each position instead of being superhuman at every position. The archetypes are as follows: (Hitters) Power, Contact, Balanced, Speed, Fielding; (Pitching) Break (H/9), Velocity (K/9), Control (W/9). - Players can select 'path' during mission to determine player archetype. Once selected, there is no changing. - Max overall for a Created Player is 89 but equipment can boost that. - No secondary positions for Created Players. - Can complete stat-based Created Player missions offline. - Only one Created Player can be used in line-up at a time. - Equipment: Equipment equipped can boost individual ratings over 99. - More individual uniform editing options added including fonts, piping styles, uniform elements, and more. Users cannot import their own logos. - 60 new pre-made logos to choose from. - Career Arc Frank Thomas program and player ratings shown. - The Exchange works similar to the past. Commons will be more valuable this year due to trade-ins. - Daily Missions (Dailies) return. They now reward alternate equipment. - Ticket Counter system returns. - New gameplay feature: Fielding Tiers - based on fielding ability attribute. They are Elite, Above Average, Average, Below Average. In videos shown, high rated 2B can make quick, elite moves to throw runner out. Below average fielder cannot get same throw made in time. Works due to addition of extra branching points on fielding & throw animation. Will primarily be factor for 2B & SS. Team working to add it for 3B. Only emerges on lunging, hard plays; not routine plays. Throw animations can also vary, may pull fielder off the base. 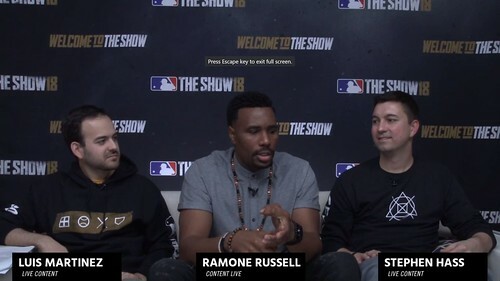 - Road to the Show Feature Suite PlayStation Blog entry originally stated for a March 6 release will now be on March 8, the same date as the next developer livestream focusing on RTTS. 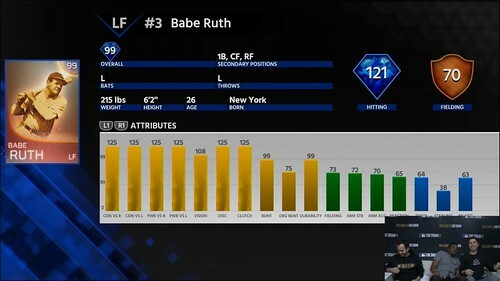 - Rating reveal for Immortal Babe Ruth.